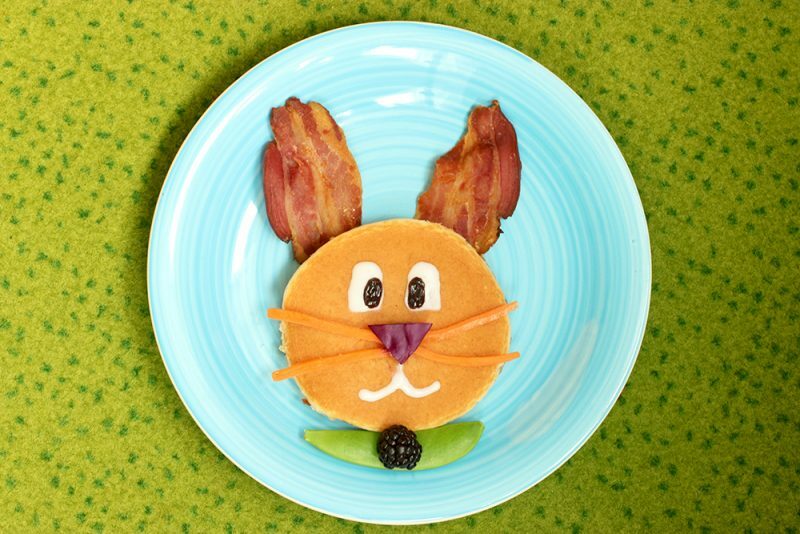 Kick off Easter Sunday with a breakfast that’s as delicious as it is cute. Pancakes and Sundays get perfectly together, this means you can start celebrating Easter holiday as early as breakfast time. For the occasion, I’ve upgraded the all-year-roundy pancakes with a cute bunny face, and it’s so sweet it’s almost hard to eat. Start with your favorite pancake recipe. I use this tested & approved pancake recipe, and it never fails to deliver delicious fluffy pancakes. Once you have put together the batter, make all the decorations. 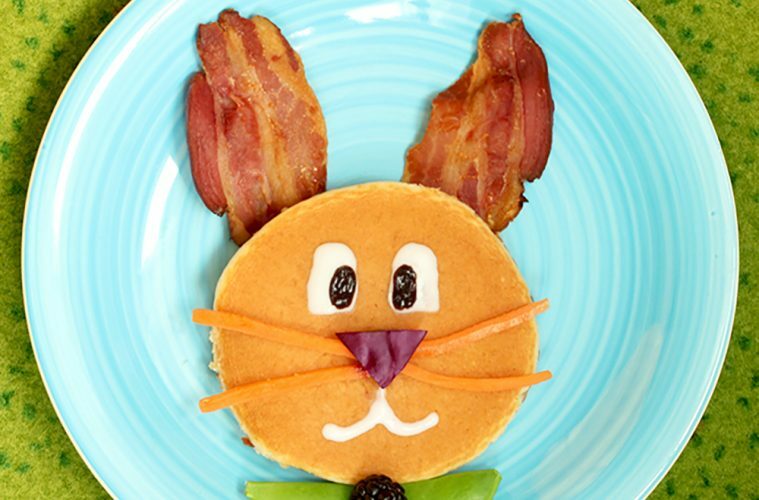 To make the decorative details of your Easter Bunny Pancake, you’ll need the following ingredients: two thin strips of smoked bacon, one carrot, one purple cabbage leaves, two blackberries, two snap peas, a little Greek yogurt and one tablespoon of melted dark chocolate. I love the salty-sweet combination of bacon and dark chocolate, as crazy as it sounds, give it a try and you will be amazed by the flavor. Begin by slicing the carrot into six thin strips; these will be the bunny whiskers. Cut the purple cabbage into a small triangular and set aside for the nose. For the bunny ears, cook bacon strips on a wide rack in the oven for 10 mins until crispy and golden-brown, then cut them in half to make the most tasty bunny ears in the world. Cook your perfectly round pancakes on a preheated pan or griddle. Let them cook until bubbles form on the surface, then flip on the other side and cook until light brown. At this point, all you have to do is put together your Easter breakfast bunny. Arrange a pancake on a plate, add carrot whiskers and purple cabbage nose. Using yogurt, spoon out two dollops for eyes and place a tiny drop of melted dark chocolate in the center. To make the mouth, I’ve gently spread the yogurt with a toothpick. Add bacon strips behind the pancake to make the ears. Finally, place one snap pea beneath the pancake and top with a blackberry to make the bow. Your bunny is ready to go straight to the table, and it’s sure to become a hit among kids and grown-ups this Easter! Why stop at breakfast? Browse other delicious Easter recipes and get easy & yummy ideas for the upcoming holidays! Pancakes and Sundays get perfectly together, this means you can start celebrating Easter holiday as early as breakfast time. 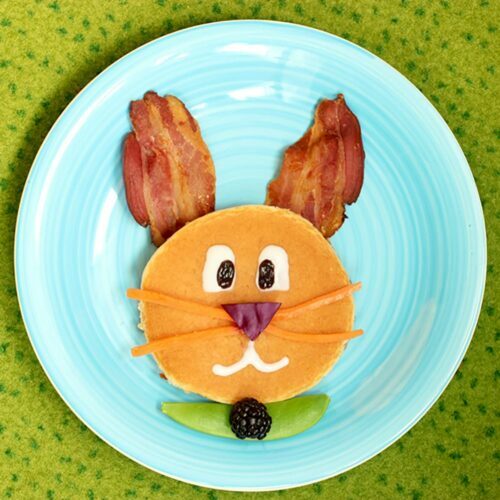 Upgrade the all-year-roundy pancakes with a cute bunny face, and it's so sweet it's almost hard to eat. Begin by slicing the carrot into six thin strips; these will be the bunny whiskers. Cut the purple cabbage into a small triangular and set aside for the nose. For the bunny ears, cook bacon strips on a wide rack in a preheated oven to 400F/200C for 10 mins until crispy and golden-brown, then cut them in half horizontally. Make the pancake batter. Cook 2 round pancakes on a preheated pan or griddle. Let them cook until bubbles form on the surface, then flip on the other side and cook until light brown. At this point, all you have to do is put together your Easter breakfast bunny. Arrange a pancake on a plate, add carrot whiskers and purple cabbage nose. Using yogurt, spoon out two dollops for eyes and place a tiny drop of melted dark chocolate in the center. To make the mouth, spread the yogurt with a toothpick. Add the bacon behind the pancake to make the ears. Finally, place one snap pea beneath the pancake and top with a blackberry to make the bow. Enjoy!